The SSPS shows you how to use your brain as a whole, with each section and its corresponding Striving Style energy contributing to your overall functioning. The four quadrants of the brain are designed to be used together. It is through using all four Striving energies or your Striving Style Squad that you emerge as a stronger, more capable human being. Your brain has four sections, each of which performs specific functions with efficiency and minimum effort. You are born hard-wired to use or favor one section of the brain over the other three. The other sections require more conscious awareness to use them and take more energy to keep them going for long periods of time. 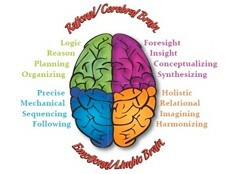 Each functional area of the brain is associated with two of the Striving Styles. One of the Styles has an external focus, interacting with the outer world when performing its role. The other Style has an internal focus, interacting with the inner world when performing its role. One of the quadrants will be most efficient and will be your Striving Style with its predominant need. We use our Predominant Striving Style because it’s the strongest and most efficient. As you have four quadrants in your brain, you have access to four striving energies. Think of it as having available to you the energy of four ‘people’. This group of four is called your Striving Style Squad. One of these four is the ‘alpha’, and dominates over the others as your Predominant Striving Style. The other three, called Associate Styles, have different needs, talents and abilities and all play distinct roles in your personality based on where they are situated in the brain. The placement of your Predominant Striving Style in the brain determines the three other Associate Styles in the other three quadrants of the brain. Leverage the power of your “whole” brain. Learn more about how you can use the SSPS to accelerate your development today! Our reports and webinars support you to keep you moving and on track. 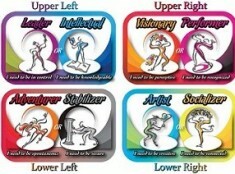 Each of the four quadrants of the brain has a functional specialty that is performed by two of the Striving Styles. One in the internal environment and one in the external. Each of the four quadrants of the brain has its own functional specialty and we favor one quadrant over the others. This quadrant is more energy efficient and we use it more frequently because it is easier.